The concept of my work is "the fossil of time". I've been possessed with substance without shape as air and water. which you shall use in your daily life. I get an idea from my daily life, what I saw, listened, touched, and perceived. Main motif of my work is nature and organism inspired by treatise on animals and plants. coloring glaze by brush not by on-glaze decoration. I wish you appreciate my work from every direction to experience my inner world. In our lives, "ma" , the significant pause in "Zen" idea is always drifting. 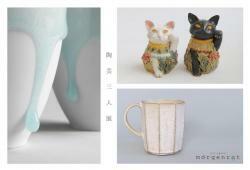 I portray the presence of "ma" shaping with porcelain clay.